Iridescent blue orchid bee (Euglossa mixta) attracted to artificial pheromones in the Colombian Amazon bordering Brazil. Copyright Paul Bertner 2018. Blue-headed saturnid caterpillar (Automeris sp.) brandishes its spines while feeding on a new leaf in the Peruvian Amazon. Copyright Paul Bertner 2017. Scarlet macaws flying at sunrise over the rainforest canopy in the Ecuadorian Amazon. Copyright Paul Bertner 2017. Strawberry poison arrow frog (Oophaga pumilio) ‘Valiente’ morph from Bocas del Toro, Panama. Copyright Paul Bertner 2016. Brazilian crab spider (Epicadis heterogaster) from Leticia, Colombia. Copyright Paul Bertner 2015. Wide-angle macro of a mossy leaf-tailed gecko (Uroplatus sikorae). Photo from Ranomafana national park, Madagascar. Copyright Paul Bertner 2015. View of Karisimbi volcano from Nyiragongo. Photo taken in Virunga national park, DRC. Copyright Paul Bertner 2015. I glance back at the Rwandan border, it is only few hundred metres away and yet it is a different world. I turn my attention back to the post-apocalyptic scene this side of the border. Ruinous streets still marred by the lava flows which had engulfed and destroyed the city 10 years past, people warming hands over oil drum fires, vast refugee camps, the involuntary flinch at the passing of an endless stream of military convoys. It is a country with a notorious reputation, and one with an irresistible draw – Virunga national park. I took one step, and then another into the bleakness and willed myself forward into the heart of darkness. The adventure starts HERE. Forest stream. 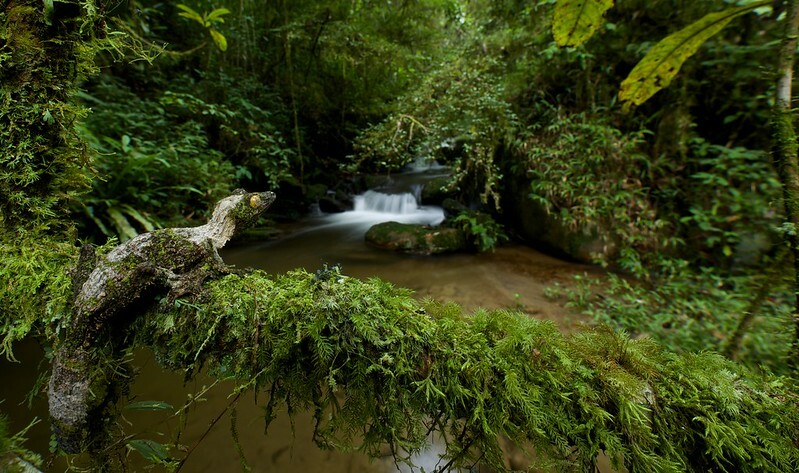 Photo taken in Nyungwe national park, Rwanda. Copyright Paul Bertner 2015. Usambara peacock frog (Leptopelis vermiculatus). Photo taken in the Usambara mountains, Tanzania. Copyright Paul Bertner 2014. 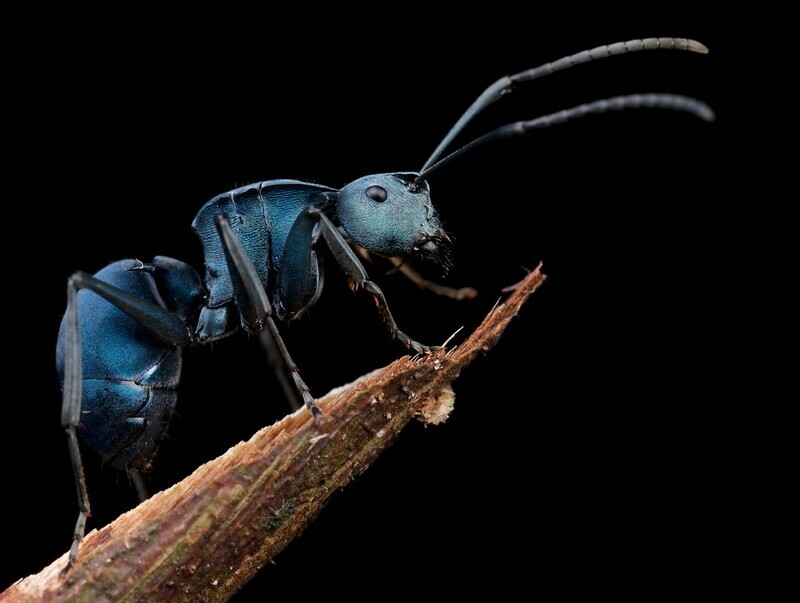 Blue armoured ant (Polyrhachis cyaniventris) an endemic species to the Philippines. Photo taken in Mt. Isarog national park, Philippines. Copyright Paul Bertner 2014. 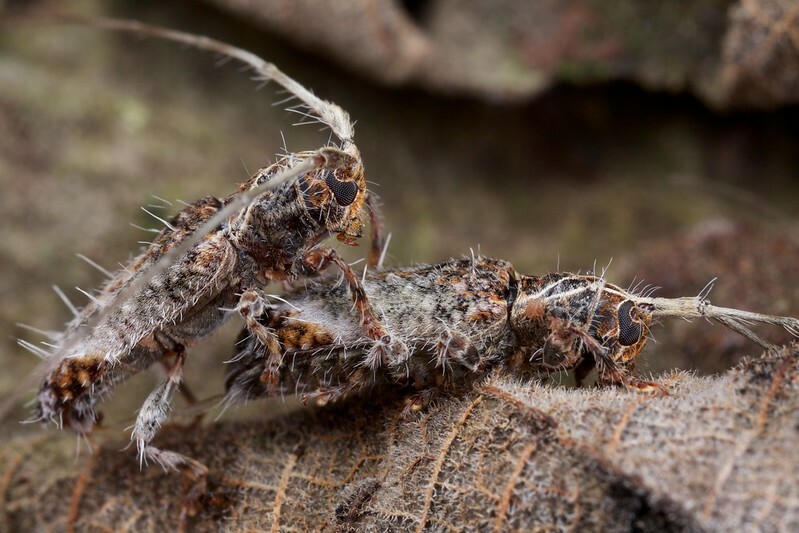 Camouflaged fungus longhorn beetles mating. Photo taken at night in Cuc Phuong national park, Vietnam. Copyright Paul Bertner 2014. 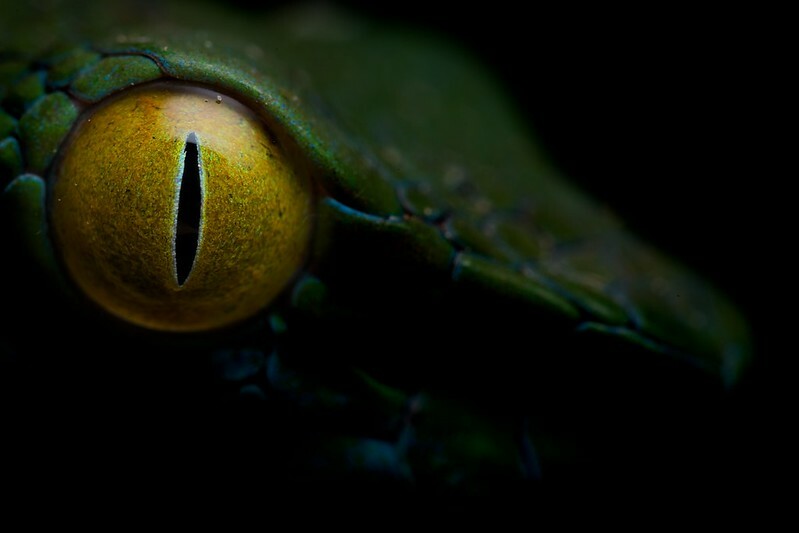 Large eyed pit viper (Trimeresurus macrops) taken in ACCB conservation centre, Cambodia. Copyright Paul Bertner 2013. Three days we’ve been trekking into the rainforest of Virachey NP. Perhaps we should have turned back when first I showed signs of fever. But now, trembling and weak, suffering from seizures and blackouts we couldn’t proceed any further. My guide handed me a handful of pills, “they’ll help” he told me. I dutifully swallowed and sat back down, my heart pounding and I wasn’t sure if my current crop of sweating could be attributed to the ‘medications’, the unknown illness or my steadily rising state of anxiety at having ingested an unknown quantity of amphetamines… The adventure starts HERE. ‘Sunrise’ on Gunung Kerinci, Sumatra, Indonesia. Copyright Paul Bertner 2013. As we drove up the steep gravelly road, I could feel us losing momentum but the ojek driver urged his bike on until finally it stalled at the road’s steepest point. For a brief moment time stalled as well, and then the bike slid backwards and I could feel myself falling. The camera hit the pavement first, and I wasn’t sure if the harsh crack was the sound of the camera or of my head which followed swiftly after. The adventure starts HERE. 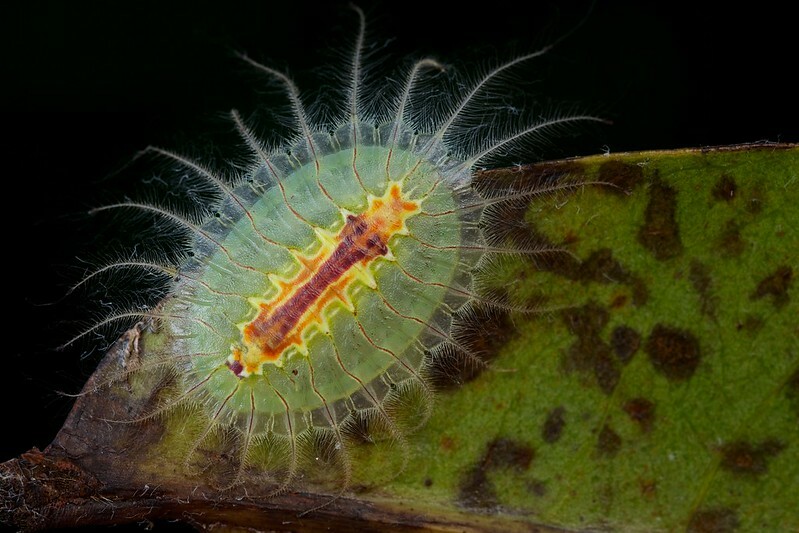 Limacodid caterpillar (Narosa sp.) from Khao Yai national park, Thailand. Copyright Paul Bertner 2013. 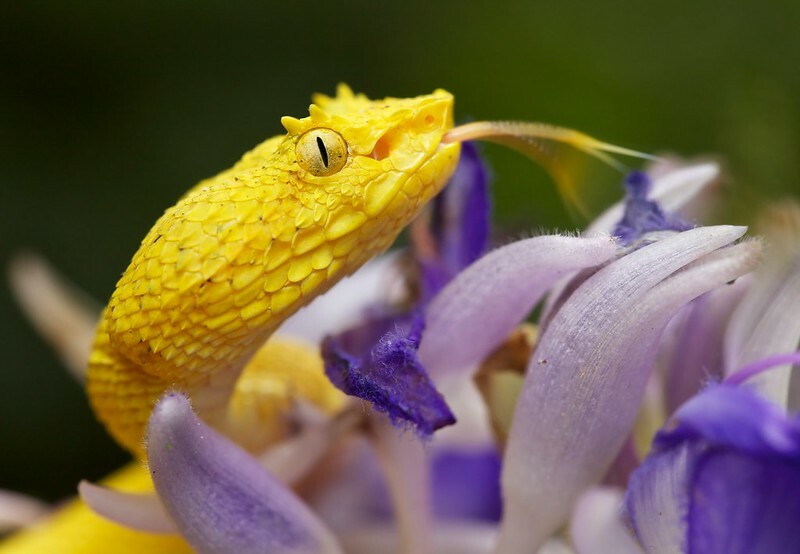 Yellow eyelash pit viper (Bothriechis schlegelii) taken in La Selva biological station, Braulio Carillo national park, Costa Rica. Copyright Paul Bertner 2013. 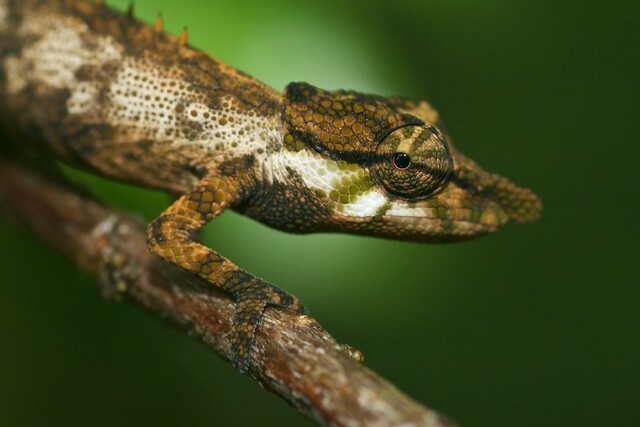 Snub nosed chameleon (Calumma nasutum). Photo from Ranomafana national park, Madagascar. Copyright Paul Bertner 2012. I throw myself off the steep embankment and clutch at the crumbling roots and plants. I turn off my flashlight. Pitch dark. My breathing comes in ragged gasps. And then voices. I cover my mouth to kill all sound. Flashlight beams scan the trail. “They’re walking slowly…too slowly!” cries the voice at the back of my head. I clench my teeth and brace my body but I feel my feet slipping on the wet clay. And then they stop, not 5 metres away. My eyes flicker upwards and I feel the searchlight slowly skinning the hide from my back. “It’s over…it’s all over”. The adventure starts HERE. 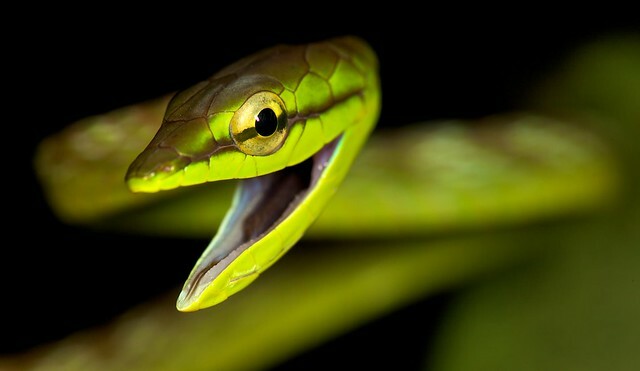 Green vine snake (Oxybelis brevirostris) displaying defensive gaping. 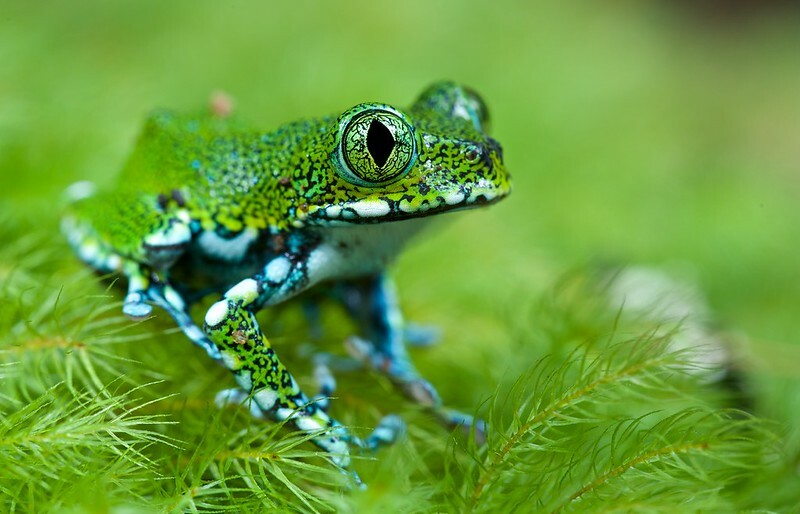 Photo from Bilsa reserve, Ecuador. Copyright Paul Bertner 2011. I scream for help from my mule driver as I sink calf…knee…hip deep into the mud. He continues walking ignoring my frantic pleas. And then I realize…he’s robbing me! Thousands of dollars of camera gear strapped to his mule and he is making the slowest getaway ever! The adventure starts here HERE. Pterochroza ocellata displaying prominent eyespots in response to threat. Photo from Kurupukari crossing, Guyana. Copyright Paul Bertner 2010. I found a word in Malay which seems to describe my ‘occupation’ – Pengembara. A kind of traveler, adventurer, backpacker, vagabond- all the above. My background is in Cell biology and genetics. I thoroughly enjoy microbiology and the study of tropical diseases. 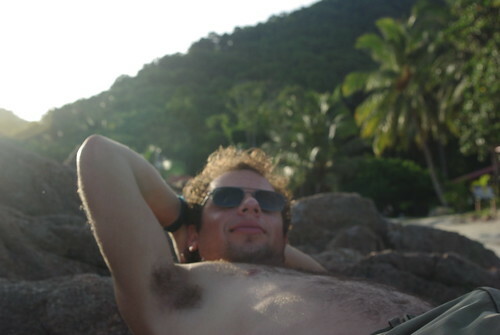 Though having first traveled to the Peruvian Amazon in 2004, I was bitten by the bugs. And since I’ve been traveling off and on to whatever rainforests I can reach, the more pristine and untouched the better. Being surrounded by the natural biota has led to me to diversify my interests into zoology, rainforest ecology, and the interesting yet challenging disciplines of tropical systematics and taxonomy. Only recently have I gotten into macrophotography, but I find it immensely satisfying and hope to continue traveling and photographing for many years yet, since each new discovery fuels the existing passion. I have been asked many times how I fund my seemingly endless travels. The short answer is by treeplanting during the summers, and picking up odd jobs like fruit picking wherever I can. However the more accurate response is that I could do any kind of job and travel the way I do, since I travel extremely cheaply and independently. After an initial outlay of costs for camping gear and camera equipment, subsequent trip costs have plummeted so that I can comfortably live a month in the jungle in my hammock for $100, just the amount required for groceries and travel. All that is required is the will to step out of our fixed notions of what we can and can’t do. The moment we let other people’s notions of what we are capable of determine our own actions is the moment that we have ceased living for ourselves and are governed by the standards of others. My lifestyle provokes a variety of responses from people, from the person who thinks it a lofty goal and says “Oh, if only…”, to the somewhat derisive “yes but what kind of a life is that…when will you grow up and settle down…”. For me simply this is what I enjoy, and if I enjoy it, I will keep on doing it…some decisions in life are just…simple. Others are more complex. Like partway through my travels in Borneo I developed a list of worrying symptoms like a temporary blindness that was complete, yet resolved itself within 5 minutes or so. Upon my return to Canada I was diagnosed with stage III testicular cancer that had metastasized to my lungs and spine. With such concerns it is easy to question one’s life and goals, etc… However, after undergoing a regimen of chemotherapy and surgeries I am again traveling, trying to put those hard months of recovery behind me and enjoying with renewed enthusiasm what the natural world has to offer. 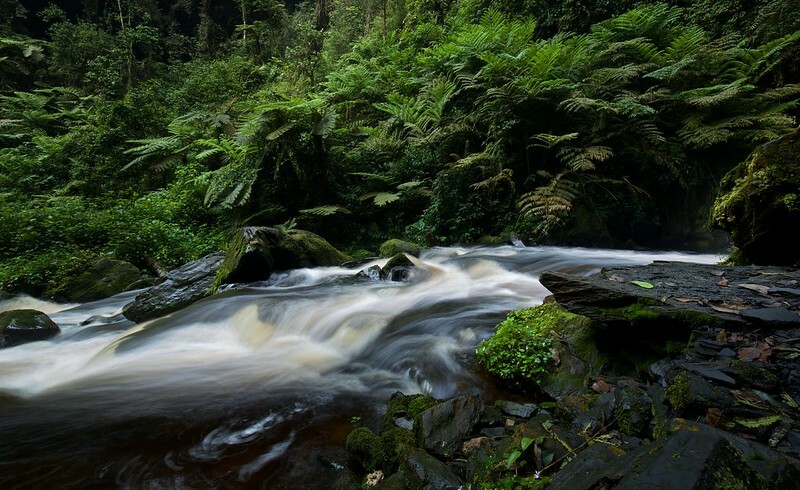 Traveling to rainforests all over the world is my goal and passion with no desire to stop in the immediate future. Equipment is constantly evolving thanks to technological advances, as well as gradual damage and replacement. This was the equipment I took with me for a longer duration project at Sani lodge in Ecuador in 2016. The equipment includes standard lenses to cover the range in field work, as well as 2 dSLR camera traps, and 1 drone. Copyright Paul Bertner 2016. I wrote to you yesterday on World Photography Forum after being blown away by your Macro photos. YOu kindly invited me to look at your website and read more on your adventures and im not disappointed, i am in fact in awe, particularly after what awful things you have been through! There are not many people i look to and respect but im telling you, you are now one person who gets exactly that from me. I have lived a fairly sheltered life but your notion about not conforming to one state of mind but in fact being open minded and challenging yourself to a new way of thinking is what we all need. Your an inspiration to me and hopefully many more! Your words are very appreciated! I’m constantly in a struggle to find balance and such comments help. It’s the unfortunate thing about our culture, that if it isn’t sanctioned or understood by the majority (or vocal minority) then it somehow becomes less valid. In this way I’ve been held back by the opinions of others, despite my enjoyment in my current pursuits. It gets a little easier with time; however, reinforcement always helps. we met at Shirley’s Bar in Lethem, before and after your trip into the Kanuku Mountains, and you left me some copies of your pics. Can you please get in touch with me on using some on a new tourist map of Lethem and Rupununi region? Thanks. Thank you for simply expressing who you are. Many thanks for dropping by and leaving such kind words. It is always uplifting to hear that people derive some interest or joy from my work. I sincerely hope that you get a chance to realize some of your aspirations. Always enjoy your writings of your travels! I also specialize in macro photography, particularly in arachnids (opiliones especially). Am planning to travel to Malaysian Borneo by end of 2012 and in my research on visiting the national parks/reserves it is always mentioned the requirement of an official guide on trails. Was this true in your experience or did you “sneak” away on your own? I have been to most continents (though not as traveled as you) and not new to the tropics on my own. Nothing is more frustrating/annoying than to have even a patient “guide” looking over my shoulder while I obsessively “work” a photo subject! Thanks in advance for any info and experiences you can share. I was there in 2009 though I don’t expect too much has changed since then. 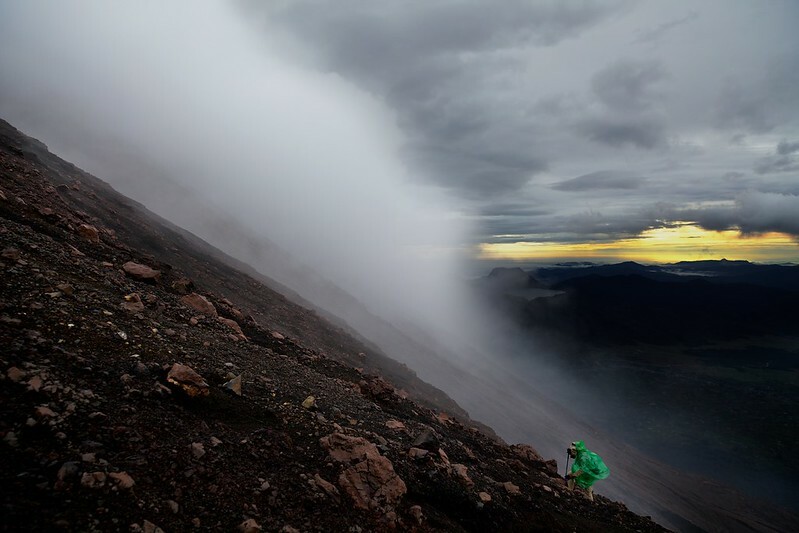 The only places where a guide was required was in Maliau basin, climbing Mt. Kinabalu and some of the caves in Mulu. Apart from that I was free to wander in Bako, Gunung Gading and many other national parks. Unlike Madagascar there was no need for sneaking. Danum Valley might say that guides are needed but I never had any problems. Thanks for your info. I will have only a month or so in Borneo and possible locations I am considering includes Bako, Mulu,and Maliau. Most important to me is to minimize in country travel time and ensuring a week or more at main points of interest for more exploration and photography time. Did you visit Imbak canyon? Was Maliau comparable/better/not as worthwhile as the other more established popular parks? One last question, did you make arrangements from home before hand or impromptu plans as you went, while in country? Bako, Mulu and Maliau were all wonderful places but I would say that Mulu was probably the best of the three and merits the longest stay. It had trekking, caving, the pinnacles, and great night walks and trails. Bako is great for being very close and accessible to Kuching. It can be done in a day, but with over 12 trails it really deserves more time. Maliau is great for trekking but less so for photography. It is quite established with a huge visitor’s center and wonderful facilities that belie its remoteness. The travel time to get there is pretty long, figure on a day in and day out with set up and take-down times. Also the larger animals are difficult to find. A much more accessible option is Danum Valley which has tons of trails, regular sitings of deer, orangutangs, elephants and a friend of mine even saw a sumatran rhino. One of the most underrated parks is Gunung Gading which is very close to Kuching and which has the Rafflesia flower. I actually even saw a leopard cat here (Felis bengalensis). You can phone in advance to see whether or not it is in bloom. I didn’t make any plans before leaving but that was because I stayed there for 7 months and because many of these parks it is so much simpler to make plans when you are actually there as opposed to phoning from phone (That is if you plan on dealing directly with the park rather than some kind of tour group or agency.) For flights into Mulu you should organize at least of few weeks in advance. Depending on group size you can manage treks/walks/caving within the park or tag along with another group to defray the costs. I never visited Imbak canyon so can’t comment unfortunately. Cheers, and let me know if there’s anything else you’re curious about. I do answer some other questions in the Q & A section in the header of the page if you’re curious. I’d love to Jurgen! Don’t know when that would be. I’m hoping to make it to PNG next year for seven months or so. It’s a pretty short jump from there to Australia so hopefully then. Australia definitely has a lot going for it in terms of endemics and interesting species I’ve been meaning to photograph for a while. Thanks for the invite! Hi Paul, I’m an Italian entomologist. I have to ask you something 🙂 How can I contact you? Sorry for the delay, I’ve been working remotely and haven’t had a chance to check the blog as frequently as I’d like. For private inquiries you can email me at pbertner@gmail.com. I just want to drop a note and say how magnificent and impressive all your photos are. In fact, I stumbled upon your blog from googling “chiggers in the jungle” (great post BTW, I had a ball reading about your pet bot fly interlude), but soon realized you were an amazingly talented macro photographer. I’m a big fan of Alex Wild, which by default makes me a fan of your work too. I love that you are also a scientist and provide many of your photos with ID for me to google later. I have been to some rain forests in Indonesia (East Kalimantan and Sulawesi ), and recently to Honduras (Las Marias- where I got a ton of chigger bites). I’ve see a lot of really cool insects in the rain forest and attempted to photograph them using a canon point and shoot- mainly I was aiming to just capture them for future ID. However, even something as simple as taking a photo for record- is not very simple for me, which makes your work all the more impressive. :-). I hope to use some of your techniques in my future travels. Also, sorry to hear about how crappy the Canadian medical system is with Lyme’s disease. I’m a Canadian too and it makes me very sad and angry to hear that. I will make sure to complain about it when I get a good chance. Best of luck and health to you, and may you see many more wondrous things to come! 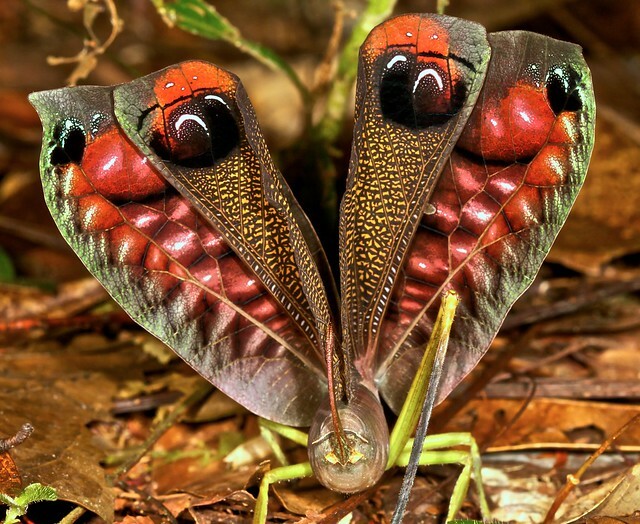 Maybe some day we might cross paths looking for insects in the tropics. Papua New Guinea is next on my list, but first I will need to successfully defend my masters thesis on plant-animal interactions! Thanks for the kind words and comment. I’ve not been to Sulawesi (it’s on the list) but I have visited Borneo several times. A wonderful place! Were you able to see N. bicalcarata and C. schmitzi? Indeed, depending on the species, even reference shots can be a challenge. Even after years and thousands of hours photographing I still run into those problems. You just hope that nature will give you a second chance! Thanks for the well wishes. The Lyme disease has really been a challenge and reading other people’s accounts I feel very lucky that I haven’t had the same extent of disability and that I am responding relatively well to antibiotic treatment. Papua New Guinea has been on my list for several years, and if there wasn’t so much bureaucracy and red tape I’d have hired a helicopter to take me into the Foja mountains for a month. Unfortunately getting off the beaten path can be a challenge, not just for the government restrictions and surat jalan, but also the mistrust and hostility between neighbouring villages. I hope that you get to visit though since I’m sure it will be a truly memorable experience. Thanks for the kind words and the link, I like your style. It would be nice to meet up, though I think I’ll be in Ecuador during that time. I’m doing some work for one of the Eco lodges for most of August and September. If you make it up that way though be sure to send me a message and we might be able to work something out.